Anyone worth his or her Brooklyn roots knows that the best biscuits in New York, if not the country, were found at the legendary Lundy’s Restaurant in Sheepshead Bay — aka THE family seafood destination of the Northern hemisphere. Lundy’s was most famous for its seafood dinners, long lines, and flaky buttermilk biscuits. When Lundy’s re-opened in 1995, after 16 years of dormancy, Neil was hired as its Executive Chef. His first task: Recreate those famous biscuits. Not one recipe had been recorded, but Neil relied on memory to eventually develop one that some argue surpasses the original. At turns flaky, tender, and always melt-in-your-mouth good, the Clinton Street biscuit is our signature item. 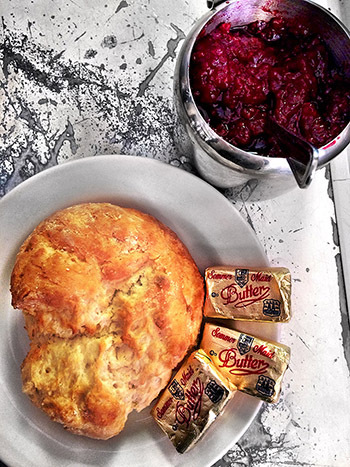 Have it warm, with our own (cult favorite) raspberry jam and sweet creamy butter — or as a sandwich with scrambled eggs, farm cheddar, and housemade tomato jam. At dinner, mini biscuits are always served, on the house. ©2017 Clinton St. Baking Co. & Restaurant, All Rights Reserved.